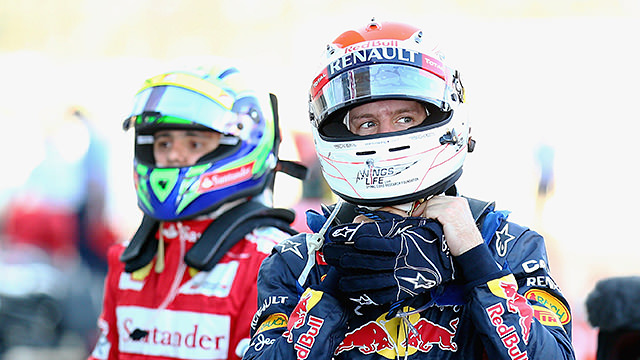 Welcome to F1Minute - Vettel takes comfortable victory in Japan, as Alonso retires. The first lap of the Japanese Grand Prix provided three separate incidents, but one of them had a significant impact on the championship. Colliding with Kimi Räikkönen as the pack squeezed up into the first corner, Fernando Alonso picked up a puncture, went spinning off and then stalled the car. He was out of the race, leaving Sebastian Vettel to lead the way to a comfortable victory and close up the gap in the driver standings to just four points. Elsewhere, Romain Grosjean had yet another first lap fail as he crashed into the back of Mark Webber, picking up a 10 second stop/go penalty for his actions. Bruno Senna was also penalised for a first lap incident with Nico Rosberg, knocking the Mercedes driver out of the race. Other retirements included Sergio Pérez, Narain Karthikeyan and Charles Pic. Vettel took the victory then, with an impressive Felipe Massa and Kamui Kobayashi joining him on the podium. Jenson Button just missed out on the podium, finishing half a second down the road to the Sauber, the pair providing most of the entertainment for the last few laps.